Kathy Penner continues the ROWT tradition of conservative principles and standing for the election of conservative candidates to village, township, county and state offices, as well as to posts in the United States Congress, Senate and Presidential Office. She was elected in March 2018 by Republican primary voters to lead the party’s organizational efforts in the area as Wheeling Township Republican Committeeman, a volunteer post. 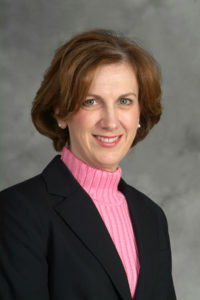 She has served as a trustee for Wheeling Township and is currently the Supervisor of Wheeling Township. She also served recently as President the Republican Women of Wheeling Township, and is a long-time member of ROWT. A 20-year resident of Arlington Heights, she and her husband Phil are members of Our Lady of the Wayside parish and are parents of three.